Nice coffee table book for anyone who loves a little bit of BC history. 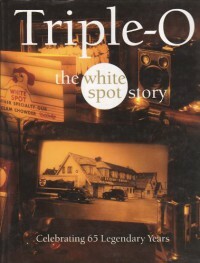 White Spot is a Vancouver-original, and this book offers the reader a quick background, celebrity testimonials, and lots of pictures. Anyone who visits BC should try the White Spot, and most who do never forget it because of the unique taste of the Triple O sauce in the burgers. I have considered getting this book and giving it as gifts to friends outside of BC as a neat reminder of one of the things that made their time here special.